New tool coating strategies can make it easier to deal with difficult-to-machine materials. By Dr. Dennis T. Quinto, Surface Engineering Consultant, and Fred Teeter, Teeter Marketing Services LLC. The continuous development of new workpiece materials aimed at making products lighter yet stronger often pose machining problems. Ongoing development work in chemical vapor deposition and physical vapor deposition wear-resistant thin-film coatings—driven by the need to continuously improve productivity— is directed at these new machining applications. This article examines tool coating options and strategies for difficult applications, such as milling new grades of titanium and machining composites for aerospace parts. There are several reasons why aerospace materials are typically more difficult to machine than more common materials, such as the steels and cast iron alloys used in the auto industry. Metal removal involves chip formation where the workpiece material is plastically deformed until it is fractured, creating a chip that is separated from the workpiece to a given DOC. Metallurgists have a standard tensile test that generates a stressstrain diagram, which defines the amount of plastic deformation (total elongation) prior to reaching the material’s breaking point or fracture strength (related to hardness). These values are given in standard materials handbooks. For example, various steels with differing levels of strength/hardness and elongation/ductility, according to composition and heat treatment, are shown in Figure 1. They can be categorized broadly as plain carbon, nonhardened alloy and hardened alloy steels. A plain carbon steel with low hardness but high elongation to fracture generates a long chip because it deforms quite a bit before breaking; conversely, a high-alloy, high-strength steel quickly breaks once the loading exceeds its fracture strength, producing short chips. The specific fracture energy is proportional to the product of fracture stress times the fracture strain; this is known as the plastic deformation energy that is converted to heat during chip formation. The second source of heat is friction generated as the chip rubs on the tool’s rake face. The higher the workpiece’s ductility, the higher its contact length with the tool rake, which produces more frictional heat. A plot of the envelopes of hardness and ductility properties of the steels along with different workpiece materials is shown in Figure 2. Machinability improves with short-chipping metals but declines as longer chips are generated (due to ductility) and higher cutting forces are needed (due to strength or hardness). Other metallurgical factors affecting machinability and tool life—second phases, inclusions, strain hardening—are also indicated. ing speeds; conversely, speeds must be lowered for workpieces with poor machinability. Aerospace-grade titanium alloys and nickel-base superalloys, such as Inconel, with excellent strength and ductility, pose the biggest metalcutting challenges because they generate high plastic deformation energy and frictional heat at the cutting edge. Their low thermal conductivity further shortens tool life because heat is not rapidly conducted into the flowing chip but remains and is concentrated at the tool/chip interface. Hard coatings for cutting tools combat the high stress and temperatures imposed on the cutting edge during chip formation. The tool life difference between uncoated and coated tools today can vary by a factor of two to 10, depending on the application. A snapshot of proven successful coatings in cutting the various workpiece materials discussed previously is also provided in Figure 2. Coatings are matched to workpiece chip formation characteristics and cutting conditions. The early generation of PVD TiN and TiCN coatings is still effective at normal machining conditions for carbon and alloy steels, but as speed is increased, TiAlN-type coatings become more suitable because they have enhanced stability at higher temperatures. Difficult-to-machine aerospace alloys demand cutting tools with optimal cutting edge design, including controlled microgeometry—the parameters defining cutting edge sharpness, such as an edge chamfer or edge hone radius. The hone may be fixed or variable along the length of the cutting edge. These microscopic features— hone radius is typically 0.001"—lower stress concentrations at the cutting edge, which is further protected by the PVD coating. Materials scientists have altered the compositions of new PVD coatings— such as adding Si to TiN to form TiSiN, increasing levels of Al in AlTiN or substituting Cr for Ti in AlCrN—to form nanostructures that yield high hardness, plasticity and oxidation resistance at the high temperatures generated when cutting difficult-to-machine materials. The coatings enable higher speeds and increased tool life while keeping other cutting conditions the same as with uncoated tools. Several studies have postulated various mechanisms of improvement for different cutting applications, e.g. better abrasive wear resistance, microcrack suppression, lowered contact friction, formation of stabilizing AlCr oxide surface films or improved heat barriers due to hard coatings. These new coatings are being applied in many demanding applications, such as those encountered in the aerospace industry. This industry expects substantial growth over the next 20 years and is using several difficult-to-machine, high-performance materials, such as composites, titanium and Inconel. These materials provide greater strength at lighter weights, which are needed to produce more fuel-efficient airplanes, but the materials require new metalcutting strategies. For example, the new midsize Boeing 787 Dreamliner, with deliveries due to begin in 2008, is expected to consume 20 percent less fuel than traditional midsize jets by using lightweight, high-strength-to-weight-ratio materials. About half of the 787’s primary structure is made from composite materials and another 15 percent from titanium. In addition to being lighter than aluminum, both titanium and composite materials resist corrosion and require less maintenance than aluminum. Titanium is also more compatible with composites than aluminum, which produces corrosive galvanic reactions with carbon fibers in the composite structure. Titanium, however, poses several machining challenges. It generally requires slow cutting speeds and low feed rates and requires radial DOCs on the order of 100 percent and axial DOCs on the order of 30 percent to avoid heat build-up. As a result, machining titanium can cost 10 times more than machining aluminum. A new grade of titanium, Ti-5553 (Ti-5Al-5V-5Mo-3Cr) is now preferred for key components over Ti-6Al-4V because it exhibits excellent hardenability and has high cycle fatigue behavior properties. Unfortunately, it is even more difficult to machine than traditional titanium alloys. Several cutting tool manufacturers are working on this problem. 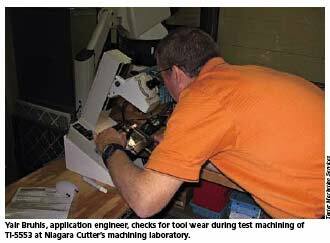 One of those companies, Niagara Cutter Inc., Amherst, N.Y., is working with aerospace companies to develop optimal tooling and operating parameters to machine Ti-5553. Testing is underway at NCI’s Reynoldsville, Pa., laboratory and in the field to explore the role of tool geometries, edge preparation techniques and the use of coatings to act as a heat barrier in solving these machining challenges. The company has developed guidelines for rough, semifinish and finish milling of Ti-5553. NCI recommends an M-42 cobalt-HSS or P/M cobalt- HSS fine-pitch roughing endmill with a TiCN or TiAlN coating and a cutting speed from 40 to 60 sfm at a feed rate of 3 to 5 ipm. For semifinish milling, a 4-flute solid-carbide endmill with a TiAlN coating, a 70- to 100-sfm speed and 5- to 7-ipm feed is recommended, and for finish milling, a 6- to 8-flute solid-carbide endmill with a TiAlN coating, operating at 400 sfm and 5 to 7 ipm. Sherwood Bollier, president of NCI, said a new tool geometry that NCI refers to as a variable-face profile, in combination with coatings and proper operating parameters, yields improved chip flow characteristics and eliminates problems associated with chip packing, also known as a bird’s nest. Composite materials are being used in an ever-growing list of products, most notably in aircraft. A composite material is typically made up of resin, reinforcing fibers and one or more fillers or additives. High strength-toweight ratios and enhanced mechanical and thermal properties make composites a viable choice to replace metals. According to Roger Bollier, president of Diamond Tool Coating, North Tonawanda, N.Y., CVD PCD coatings are the best choice for machining many composites. DTC supplied coatings for development work by the National Center for Defense Manufacturing and Machining, Latrobe, Pa., for Lockheed Martin Aeronautics, which machines advanced composite wing-skin material for the F-35 Lightning II stealth fighter. Initial machining of the wing-skin material produced short tool life and excessive delamination. The use of 20µm-thick CVD PCD coatings, in combination with optimized tool geometry, increased tool life more than six times and reduced the workpiece delamination problem. Machining performance improvements have always relied on the synergies in designing tool materials, cutting edge geometries and coatings. 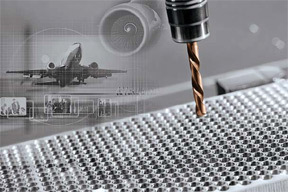 In recent years, PVD coating developments in particular have lowered the traditional barriers to metalcutting productivity in the so-called difficultto- machine aerospace materials. Dr. Dennis T. Quinto, with 25 years of experience in cutting tool and coating technologies, recently retired from Oerlikon Balzers Coating USA Inc. as technical director and was formerly advanced technology director at Kennametal Inc. He is now an independent surface engineering consultant. Contact him by e-mail at den nis@quinto.net. Fred Teeter is managing director of the Surface Engineering Coating Association, Amherst, N.Y., and president of Teeter Marketing Services LLC, Niagara Falls, N.Y. Contact him at (716) 791-8100 or fred@teetermarketing.com or visit www.surfaceengineering.org.